As Mother’s Day makes an appearance on our calendars every year, I thought I’d share a few things that can enable you to create a more enjoyable occasion for yourself. These ideas are in no particular order of importance. Sift and sort through this list for ideas that make sense for you, your life situation and personal preferences. Suggestion #1: Get clear about any expectations and assumptions you may have about this holiday, recognizing that Mother’s Day can be emotionally charged for some stepmothers. This is true whether you’re a stepmother and a bio-mom or a mother-by-marriage (no bio-kids). This annual Sunday focused on bio-moms can be an emotional magnet—it can bring all your unhealed emotional wounds, outstanding resentments and any unmet needs related to being a stepmother to the surface of your awareness. Suggestion #2: Look at your beliefs about what makes a happy Mother’s Day for you. Resentments, emotional wounds and rage triggers are caused when your reality conflicts with your needs and your beliefs. Until you start to uncover and identify your beliefs, you’re unaware of the vast majority of them. Yes, it’s true. Time spent exploring your beliefs is a true act of self-respect and usually a fascinating experience. There’s tremendous wisdom and power in discovering your personal set of beliefs. Most of your beliefs were formed when you were very young. They were promptly filed away into your subconscious minds. You forget that you created them as little ones and that you can change them at any time. How do you believe you should be treated by your stepkids right before, on or right after Mother’s Day? Specifically, what do you believe they should do, say, not do or not say? What do you believe your partner should do, say, not do or not say to you on Mother’s Day? What do you believe your role is in creating a good Mother’s Day for yourself? What role, if any, do you believe you should play in helping your stepkids honor their bio-mom for Mother’s Day? Suggestion #3: Do you have any past Mother’s Day-related emotional bruises that still bother you? This is a gentle reminder to bring the power of your own lovingkindness to yourself in this process. Review your needs and hopes with the same compassionate attention you would naturally offer your best friend when helping her prepare for a big event in her life. What happened last year on Mother’s Day? What’s your history with your own mother on Mother’s Day? What are your tender emotional buttons on this topic? How can you provide extra TLC for yourself during this holiday? Is there an imbalance between the way Mother’s Day and Father’s Day are celebrated in your home? What changes could be made, going forward, so both of you feel both holidays are honored in a satisfying way? Talk with your partner, a trusted friend or another stepmother about what you’re feeling and about what you’ve discovered about your feelings. This can help you feel understood, supported and prepared for any possible planned activities over this weekend. The key here is to be conscious of what you need and expect so you can eliminate any unconscious, self-sabotaging experiences. Suggestion #4: Assume your partner’s mind-reading license has expired. Have a Mother’s/Father’s Day conversation with your partner in March or April to avoid feeling hurt, unappreciated or disregarded on Mother’s Day. With some conscious planning, you can avoid any trauma and emotional ricocheting that can generate more resentments. You can also avoid creating an emotional wedge between you and your partner caused by misunderstandings or mistaken assumptions. You can avoid experiencing these by talking with your partner at least a couple of weeks before the holiday. A disappointing, hurtful, upsetting Mother’s Day can result in a diminished, vengeful or otherwise uncomfortable Father’s Day experience. Both partners lose in this scenario. My vision for Stepmom/partner couples is for both partners to stay lovingly connected by successfully enjoying both holidays, even if it means creating non-traditional plans. As long as you two are good with it, that’s all that really matters. Right? Right! Use your talents and skills when taking responsibility for your own well-being on Mother’s Day. Make being happy more important than being surprised. Talk with your partner and see if you can agree on how to handle both Mother’s and Father’s Day holidays. Often the stepmother is the do-er, the lover of holidays and the energetic creator of fun experiences for her partner and any children in her life. The women who find smoms.org often do more for their partners on Father’s Day than their partners do for them on Mother’s Day. Depending on the couple and the state of the relationship, this can be a breeding ground for martyrdom and resentments. Resentments can blow up into intimacy-impacting disconnections between a Stepmom and her partner. This disconnection feels terrible. If unresolved between you, it can also have a significant negative impact on the expectations and plans for a happy summer. You can avoid all this distress by having an honest conversation with your partner. Find a balanced way to handle both occasions as a “we” experience with a shared challenge—as one team with the same goal. This may mean the Stepmom needs to agree to do less and her partner needs to agree to do more while there’s still time to plan for both holidays. If you enjoy surprising others and being surprised this is a place for potential self-sabotage. Creating a specific plan with your partner can take the potential disappointment, possible pain and emotional shrapnel out of both holiday experiences. Suggestion #5: Take a look at any emotional ledger you may be keeping with your partner or stepkids. It’s human to keep track of how others treat you. If your partner, your stepkids and their bio-mom have let you down, hurt your feelings, disregarded you and angered you, a Stepmom’s emotional ledger can involve a long list of very real and hurtful situations. Because of the commercial and social hype around Mother’s Day it can be tempting to hope that a fabulous Mother’s Day might balance or erase some of that ledger. Become aware if you’re holding any outstanding emotional accounts receivable that you may hope or assume will get paid up on Mother’s Day. Acknowledging and interrupting this unspoken expectation can spare you, your partner and your stepkids painful emotional eruptions that can occur when a stepmother feels disregarded or disrespected on Mother’s Day. Whatever you can do to avoid this upsetting experience is very self-loving and good for your connection with your partner. Balance and settle your past issues in other ways—and on other less charged days. See the smoms.org article called “Are You Keeping an Emotional Ledger?” for ways to process your list. Suggestion #6: Take responsibility for having a happy Mother’s Day by getting creative. I understand that this might be a sensitive and potentially anger-triggering suggestion for you. Why? Many of us have the belief that a happy Mother’s Day is an occasion where our partners are supposed to dazzle us with their understanding of what we need, want and like. We want to be delighted that they make the effort and that they do, say, buy and arrange things that make us feel treasured, at best—or appreciated, at least—by our partner and stepkids. This is another potential set-up for feeling awful and creating pain for you and your relationship with your partner. What if you made a new choice this year? Consider reframing Mother’s Day as a day for you to acknowledge your own worth as a mothering figure in the lives of any children you care for. What if you decided that your well-being and peace of mind are so important that you’re not going to leave your enjoyment of the day to chance or at the mercy of any unconscious issues that might cause you stress? What if you plan your own Mother’s Day? This is not about becoming controlling. The urge to control is a common fear-based reaction to past bad experiences, unbalanced emotional ledgers and painful resentments. This could just be an experiment. You may have the belief that if you participate in the planning, you’re ruining the special surprise or squashing any heartfelt intent from your partner or the kids involved. This is a limiting, false belief—a set-up that puts your happiness at risk. Who wants that belief in your personal book of beliefs? Keep your mind and heart open to new ideas. Choose to make having a great Mother’s Day more important than any old beliefs. Make a new belief—“I do whatever is needed to make sure I have a fabulous Mother’s Day because I deserve to have a fabulous day.” If you feel your heart harden in this planning process, take note and look at what you’re thinking, believing and imagining about the future. What are you expecting? How are you feeling about taking care of your own happiness on this holiday? If you’re feeling anxious about it, remember this: Anxiety is often the anticipation of anger or the fear of a future boundary violation. If you feel anxious, use that energy in a positive way to create a fun day for yourself where you can relax, knowing you’re going to be A-OK.
Mother’s Day is intended to be a happy, nourishing, honoring day for all the women who mother others. Giving yourself permission to use some of your energy to find fun, peaceful, creative options that are doable in your life situation is a great way to take care of yourself. The good news? The odds of this approach creating happy memories and a more loving connection with your partner are excellent. Suggestion #7: Start a new tradition for yourself with your partner, your stepkids and any bio-kids you have. Talk with your partner and invent your own day for being honored in your family. Create something that doesn’t compete with Mother’s or Father’s Day. Kids love fun rituals and traditions. What fun ideas can you start for your family? This is a place for your uniqueness to be honored. How about creating a [insert your name here]’s Day. What do you love to do? Pick a day each year when everyone does it, eats it, listens to it, plays it, makes it, watches it and experiences it. The sky’s the limit and the memories of those shared experiences can fuel you through a lot of other situations. How does it feel to challenge yourself to create something joyful on your special day? Suggestion #8: Mute your harsh and critical inner voice—we all have one, and Mother’s Day is no place for it. Here’s a short, straightforward way to protect yourself from any crushing, hypercritical self-talk and to distinguish the unforgiving introjected voice from your loving inner guidance. Ready? If whatever you’re thinking makes you feel less good about yourself in any way, hit the mute button, change the channel, shout, “be gone!” and move to another more loving inner conversation. Yes, it’s that cut and dried. Refuse to ruin any more of your precious daily moments by listening to or engaging in not-so-loving self-talk. Suggestion #9: Mothers-by-marriage, be especially kind to yourself. For those of us who, for a variety of reasons, do not have our own bio-kids, Mother’s Day can range from being a non-event to a painful excavation of any as-yet unhealed wounds caused by not being a bio-mom. It’s important you take responsibility for creating a nourishing day for yourself. Your partner may not understand what you need or are expecting from year to year. You may experience Mother’s Day in a wide variety of ways—some of them upsetting and others challenging to process, and all of them valid. It can feel like the world is jumping up and down on your broken heart. It can be a time to focus on your own mother if she is still around. It can be a time to daydream with your partner about the future children you already love and look forward to bearing and raising. It can be a time to mourn the loss of the future dreams you didn’t get to experience because you’re not going to be a bio-mom. 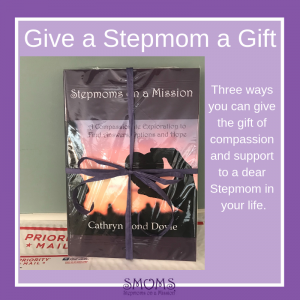 It can be a time to share a loving connection with your stepkids as you help them prepare to honor their mother, choosing to feel the joy from any love or appreciation they share with you as their Stepmom. If your stepkids are caught in the Loyalty Wars, it can be a painful and maybe no-longer-unavoidable time to acknowledge that you’re paying a heavy price as a target of their wrath and confusion. It may be time to consciously and compassionately accept that your stepkids are caught in a terrible bind, unable or unwilling to acknowledge your role and effort in their lives due to the punishment they experience (and rightly fear) from their own bio-mom. As an adult, you can find ways to support yourself. In spite of how they’re acting, your stepkids are doing the best they can, compelled and limited by their young brains to survive this painful circumstance while trying to gain/keep/earn their bio-mom’s love and attention. See Chapter 28 for more about the Loyalty Wars. It can be a time to do something wild, fun and crazy with other non-bio-mom friends. It can be a time to do something special with your partner or your own kids, since this holiday will likely be stepkids-free. It can be a time to give yourself whatever you want. Loving, compassionate solitude to breathe, to rest, to hike, to shop, to travel, to craft, to read and to acknowledge your own worth in special ways is always a good option. Suggestions #10: Holidays hold different meanings and varying degrees of importance for each of us. So it’s about becoming clear about what you feel and what you want. There’s no good reason to judge whatever you feel. Talk with your partner about whatever you think and feel about Mother’s Day. Remember that as much as he loves you, he can’t read your mind. Even though Hallmark, TV and the movies try to get you to feel holidays should be observed in certain ways, be courageous and tell him what this one means to you. Exercise your personal power—ask him to help you create exactly what you want for a happy Mother’s Day. There are so many unique circumstances in your life. I want to encourage you to use Mother’s Day as a time to bring your attention back to yourself. Think about what you can do to honor yourself. You deserve a pleasant and happy Mother’s Day, whether your stepkids do anything to honor it or not. You deserve to appreciate yourself and I believe your partner wants to as well. If the stepkids you care for also appreciate you, that’s a terrific bonus. May your future Mother’s Days be happy ones.